Welcome to the fresh new participants of IML MAS & CAS 2019! We are delighted to welcome 22 executives for the 2019 IML MAS & CAS and will welcome further CAS participants throughout the year. 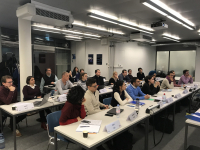 This is the first edition of the new part time Executive Master in Global Supply Chain Management. The majority of the 14 nationalities are pursuing the course while employed in organisations in Switzerland. 25% of the class are taking up internships offered by IML partners. The diverse class includes 50% women and 40% above 10 years experience. Welcome to the fresh new participants of IML MAS & CAS 2019!We are delighted to welcome 22 executives for the 2019 IML MAS & CAS and will welcome further CAS participants throughout the year. This is the first edition of the new part time Executive Master in Global Supply Chain Management. The majority of the 14 nationalities are pursuing the course while employed in organisations in Switzerland. 25% of the class are taking up internships offered by IML partners. The diverse class includes 50% women and 40% above 10 years experience.